DUBLIN—Saturday, May 25, was a historic day for Ireland. The Eighth Amendment to the country’s constitution, which was introduced in 1983 and effectively banned abortion in all but the most extreme circumstances, has finally been removed, and the face of Ireland is changed utterly. Contrary to what the establishment political parties have already started to say, the credit for this victory rests squarely with the women of Ireland. All women—cis, trans, young, old, gay, straight, and every way in between, workers, students, voters, and the women who live in Ireland but couldn’t cast a ballot but campaigned endlessly anyway. The men who supported them and played their part alongside them. These are the heroes and the victors of the Repeal the 8th campaign. This referendum result is a people’s victory. We made our demands, and we pushed them on. Now, we need the legislation to make it real. People understood and recognized the lies of the so-called “pro-life” side. They agreed that the Eighth Amendment, which equates the life of woman and fetus, not only banned abortion but, in practice, made second-class citizens of women when they were pregnant. The Eighth tied doctors’ hands and prevented them taking action when women’s lives and health were in danger. Women were denied chemotherapy, were locked away and threatened with force-feeding, were forced out of the country and ignored. We were criminalized for daring to take action when we were denied a choice, criminalized for seeking help and medication from women online. No more. The campaign was difficult; to deny that would be foolish, and it would negate the valiant efforts of the campaigners who faced vicious opposition at stalls and during leaflet drops, during canvassing, or for voicing their support for choice. We would say it was the death rattle of “old Catholic Ireland,” but it could be demoralizing after a bad day and hard to see a successful end. Now we are vindicated. People voted for their children, grandchildren, friends, parents, for themselves, for the named and unnamed killed or hurt by the Eighth, for those women who have gone before us and fought for a better country and most importantly, we voted for the future, one where all the people in Ireland will be treated fairly, with dignity and respect. 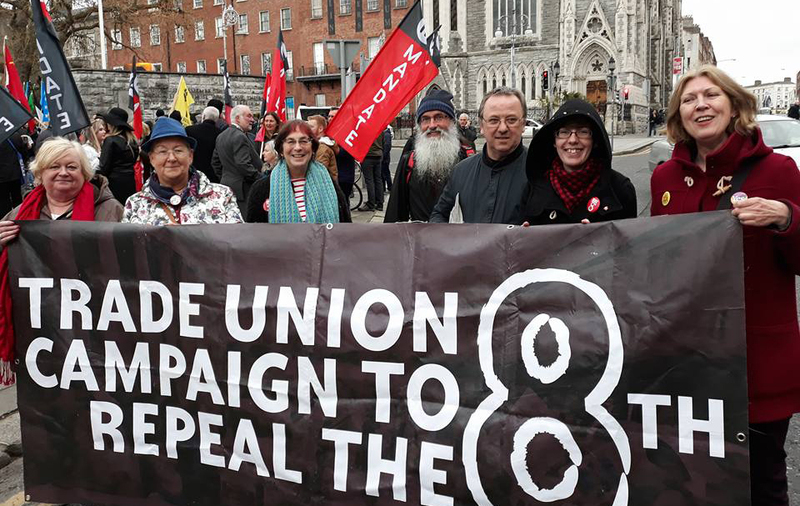 Support poured in from the trade unions, left-wing parties, individuals, and local campaign groups under the Together for Yes campaign and the Repeal the 8th Coalition. Activists picked their battle grounds, be it as a parent, teacher, migrant, witch, or trade unionist, but we all worked together. We were unified in action once more, as we had been for marriage equality, the right to water, and the anti-war marches. On the hard days—and there were many—we buoyed each other up. We kept each other from being overwhelmed and drowning by sharing the burden. International support came from the Irish scattered all over the world, often forced there through austerity measures. 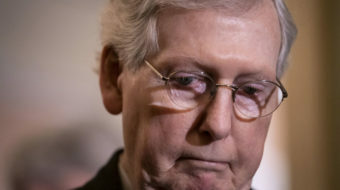 For them, there must have been an immediate connection with the 12 women forced abroad for abortion services every day. They too were ignored, forced out, and had to leave loved ones behind. 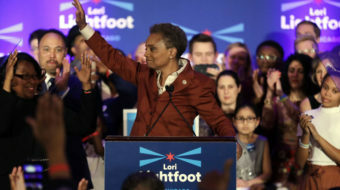 The return home for the vote was overwhelming, and the emotional scenes in the airports of people marching past with “Repeal” T-shirts and “Yes” badges reduced more than a few seasoned activists to tears. Women in France, Canada, Australia, Britain, the United States, Chile, Poland, and many more countries called out to us across the mountains and oceans with greetings, support, love, and solidarity. They were and are defending the gains of women’s struggles or are engaged in similar struggles for the right to abortion and healthcare in their own countries, but they saw their fight and ours as one and the same. Their actions are examples of internationalism at its finest. The women of the Six Counties [Northern Ireland] saw no border when they worked alongside the women in the Republic of Ireland for repeal. We won’t either as we stand by them in their own fight for abortion access. The chains of women will be broken across this island. Divisive forces from inside Ireland and out will try to damage the solidarity built during this struggle, but we will not let them. We cried and fought together and we now celebrate together too. We know those who stood with us, and we will not be separated again. Our eyes are fixed on the next battle. We have only begun to know our power, and we will take the Earth—but we can only do it together. 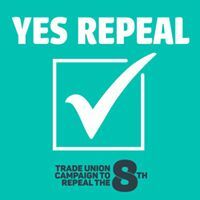 Laura Duggan is a member of the trade union campaign to Repeal the 8th Amendment and of the Communist Party of Ireland. This article originally appeared in Morning Star. Laura Duggan is a member of the Trade Union Campaign to Repeal the 8th Amendment and of the Communist Party of Ireland.